Be the first to share your favorite memory, photo or story of Basil. This memorial page is dedicated for family, friends and future generations to celebrate the life of their loved one. 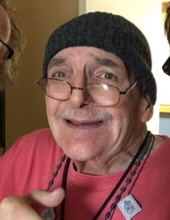 EDGERTON--- Basil J. Dewey, age 75, of Fort Atkinson, formerly of Janesville, died on Friday, April 5, 2019, at Dycora Transitional Health & Living, Fort Atkinson. He was born in Janesville on September 6, 1943, the son of Floyd and Eleanor (Kauffman) Dewey. Basil enlisted in the U.S. Navy, where he worked as a cook during his 2 tours in Vietnam. After his military service, he worked as a Journeyman Welder for Fairbanks Morse for over 20 years, and later was employed with Van Galder Bus Co. He enjoyed fishing and hunting. Basil is survived by his 2 sisters; Mary El Dewey of Gainesville, FL and Kittie Lee of Janesville; and numerous nieces, nephews, cousins and friends. He was preceded in death by his parents; and siblings: Philomena Dewey, John Dewey and Christopher Dewey. A Memorial Service will be held at 11:00 a.m. on Friday, April 12, 2019, at APFEL EHLERT FUNERAL HOME & CREMATION SERVICE, 315 Lord St. (Hwy 51) Edgerton with Fr. Pete Auer officiating. Burial will follow at Fulton Cemetery with Full Military Honors. Visitation will take place on Friday from 10:00 a.m. until the time of service at the funeral home. To send flowers or a remembrance gift to the family of Basil J. Dewey, please visit our Tribute Store. "Email Address" would like to share the life celebration of Basil J. Dewey. Click on the "link" to go to share a favorite memory or leave a condolence message for the family.